1) Is your craft ready? Don’t rush it. Be patient. 2) Is this the right book? 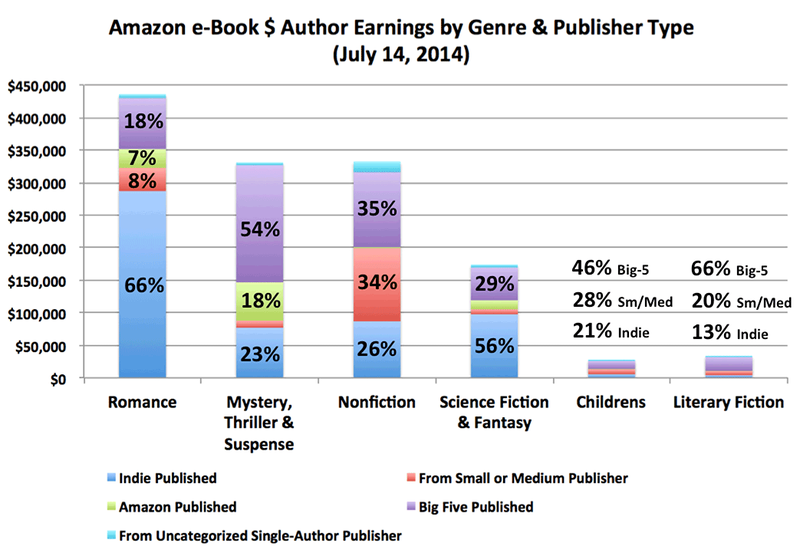 The chart that crushes the dreams of indie children’s and literary writers. If you’re in romance, mystery, thrillers, SF&F… that’s indie heaven. Plan ahead. Lead with your best work. 3) Are you willing to invest money and time in the book? Publishers would invest time and money in editing/copyediting/cover art for your book—you should plan on doing the same. Are you willing to spend time and money on marketing? What works in marketing is constantly shifting: when I first launched in 2011, big launch parties and direct-solicitation of book bloggers for reviews was a great way to get off the ground. A spike in sales got word-of-mouth going and some visibility/discoverability on the Amazon marketing machine. Then came blog tour companies that would arrange book tours and reach far more people than you could with direct queries. Now both of those methods (direct solicitation and book tours) are waning in their effectiveness… along with blogs in general. Whereas I started with book bloggers, I wouldn’t recommend that path now for launching a book. These days, buying ads in newsletters like Bookbub and BookBarbarian (see Paid Advertising) can do far more to shoot your book up the charts… but getting those can be problematic, because they turn down more people than they accept. But the upshot is that it will take money to launch a book well—not a ton of money, but some. Rule of Thumb? $500-$1000 to publish a new book/new series/new penname (that includes cover and marketing). That might seem like a lot of money, but I know very few legit businesses that you can start for that little money up front. And if you absolutely have to start with zero money up front, that’s possible too… but you’ll be at a disadvantage. I recommend waiting (keep writing, just hold off on publishing) until you have that level of funds to invest. With any luck, you’ll make that back in six months to a year, and possibly a whole lot more. The idea is that you’re launching a career here, not just a book. And that takes some investment. However you launch, you need some sales and reviews to feed the Amazon marketing machine, which will then enhance your visibility (through also-boughts, email campaigns, etc.). Have a plan to feed the machine, and it will be your friend. Going indie is like running a small business. Have a plan for how to succeed. 4) Are you willing to give up the dream of paper for this book? As an indie publisher, 90% of your sales will be ebooks. If a large fraction of your sales are paper, it is probably because your total sales are low and those few paperbacks that sell to friends and family are a significant fraction of your total. As an indie author, ebooks are your business and that’s where you’ll make your money. Getting into bookstores may sound great, but it brings the possibility of returns, which can easily eat up whatever profits you have made. You can still have paperbacks (they’re useful for signings, libraries, giveaways), but paper isn’t the mainstay of your business. If you’re very successful, you may get offered a contract with a traditional publisher who will get you into bookstores. Unfortunately, by the time you’re that successful, giving away your ebook rights for a chance at paper distribution can be very costly. Worry about that if/when you get there, but initially, understand that this book may never get into the bookstore. 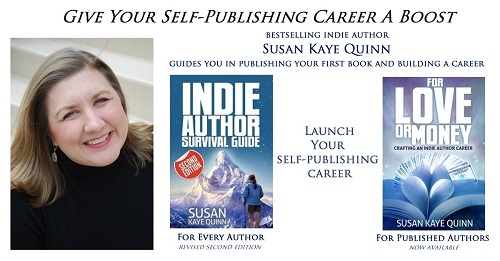 Indie is not a route to seeing your book on the shelf at Barnes and Noble. 5) Are you trying to score an agent or book contract by going indie? I have an agent now, but only after penname hit the charts in a major way. Then again, I didn’t really want an agent (meaning I didn’t seek one out)! She came to me, and I only use my agent to sell audio and foreign rights—I’m simply not interested in traditional publishing at the moment. Indie publishing and traditional publishing really are two separate ecosystems. They can be combined, but you’re functioning differently in the two markets. If you really want to score a book contract with a major publisher, you’re better off pursuing that directly. Unless your indie book is wildly successful (I’m talking The Martian level of success), you’re unlikely to have traditional publishers knocking on your door. I know all kinds of NYTimes bestselling authors who do not have publishers clamoring after them. And even the ones who do often turn those deals down because they would lose money by giving up their ebook rights to take a traditional deal. The few NYTimes bestsellers who have negotiated print-only contracts, keeping their ebook rights, remain the exception rather than the rule (I know a couple, and even those have a rocky road with it). 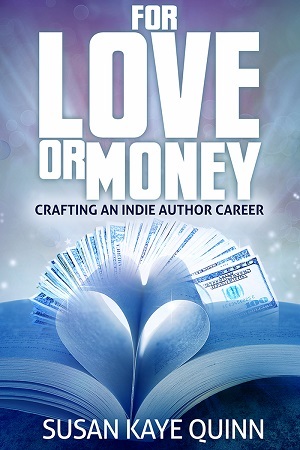 Success as an indie brings many rewards (including financial ones), but it is far from automatic that indie success means a book contract, or that you’ll want that contract, even if it comes your way. If you are yearning for a traditional contract, you should probably pursue that route directly (although, if you prove yourself in the marketplace with indie publishing, you will have better leverage if/when publishers come courting). 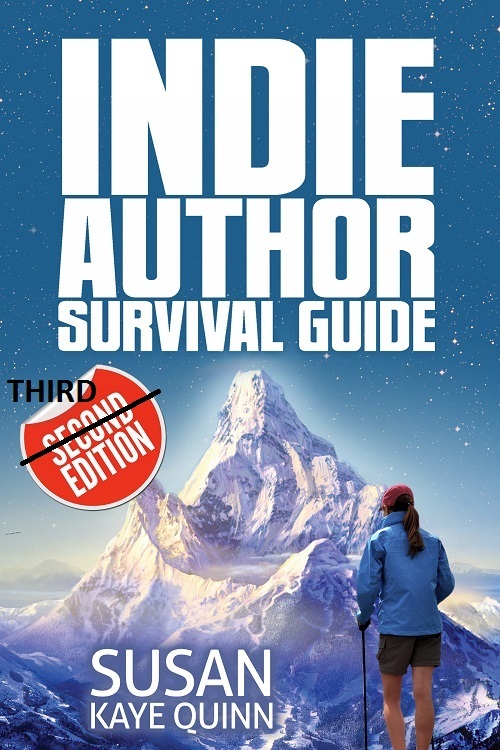 Indie is not the route to traditional publishing, but rather is its own publishing model. 6) Do you have an online presence/social network? It is not necessary to have a social media presence to launch a book. Now, social media can help you, but it’s far from necessary. And the truth is that measure of help is a small lever (see Book Discovery in the Digital Age). You don’t have to have a huge following to launch a book. Don’t spend tons of time trying to build an audience *before* you publish. Social media presence FOLLOWS sales; it doesn’t GENERATE sales. Spend that time writing more books and you’ll have more sales. Period. All that being said, we’re living in the 21st Century, and having some level of online savvy will help you take advantage of building a following once you do start to publish. Trying to learn all that stuff on the fly is tough, so it’s to your advantage to figure out some of it before you start. But I list this as a question to ask yourself not because you have to have a social media presence… but because a lot of authors seem to think that you do, and I want to make sure you know that you don’t. Friends can help, but you don’t have to have a following to launch a book. If you use social networking, do it authentically. Don’t be a spammer – there’s really no point to that, and it will only hurt you. 7) Do you have concrete goals and a marketing plan to reach them? Make a Five Year Plan. Decide your goals not just for this book, but future ones as well, and make a marketing plan to achieve those goals. Set reasonable expectations. Even if your eventual goal is to make the NY Times bestseller list, start with a goal of making back your investment on your book. Include action items like “buy an ad and hold giveaways” not “magically reach 1000 sales in the first week.” Your plan will definitely evolve along the way, but having realistic goals will keep you grounded while going through the process. Set Goals. Make a plan. Keep your expectations realistic. I believe in not leaping into indie publishing until you’re ready. I believe in treating indie publishing like a business and making a plan for success. I believe in publishing Indie First (see Trad-Pub, Small-Pub, Digital Only or Indie First) as a general rule, but the right path for you (and your book) can only be found by looking at your personal goals first. I believe this is true of the first book you publish, but even more true of the ones that come after that. Next we’ll talk about making those marketing plans, creating a beautiful package for your book, and how to market your book without feeling like a slimeball.